-- Select a Size/Color -- Size 0 Size 1 - Out of Stock! Size 2 - Out of Stock! Size 3 - Out of Stock! Size 4 - Out of Stock! Size 5 - Out of Stock! Size 6 - Out of Stock! 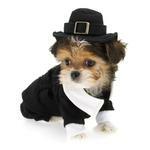 Now your pet can help celebrate Thanksgiving with this detailed period costume! 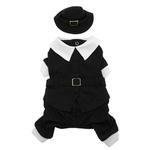 Now your pup can feel like they're part of history with the Pilgrim Boy Dog Costume. Perfect for Thanksgiving or any holiday festivities, you will definitely be giving thanks for such a cute pet! This Pilgrim costume for dogs is easy to put on with snap fasteners down the belly hold it in place. You'll love all the details and design of this comfortable four-legged costume that shows off the dress of the time. This costume features a large attached white collar, real metal buckles on the belt and hat band, and white cuffs. Complete the look with the included Pilgrim Hat that secures with an elastic band. 100% cotton. Don't forget to submit your Thanksgiving pet photos below for a chance to be Pet of the Day! Your dog or cat could also win up to $250 in a BaxterBoo.com shopping spree! See photo contest rules for details! Pilgrim Boy Dog Costume Customer Photos - Send us your photo! He's usually very cheerful and always running around and dressed up for every occasion ?? Zaylee is getting ready for Thanksgiving . She is always Thankful for her toys and treats !! Just 8 dogs who love to dress up and pose for the camera. We would love to model any clothing items and advertise for you on our page if you like. Will is prepared for Thanksgiving dinner (carrots and green beans) while wearing his Pilgrim suit. Hamlet the Doxie Pilgrim. Don't mess with his turkey! Hamlet is ready for Thanksgiving! Dobby in his pilgrim costume from BaxterBoo! Another photo of cookie! :) Enjoy! Posted On 11/19/16 by Christina B from Redlands , CA Yes, Christina B recommends this product! We love our Pilgrim costume !! Our little Zaylee looks adorable and delicious ready for Thanksgiving !! Posted On 12/08/15 by Chrisann S from , Yes, Chrisann S recommends this product! Cute, but be wary of size discrepancy! Posted On 11/15/15 by Rachel from Pottsville, PA Yes, Rachel recommends this product! I bought this pilgrim costume (size 3) for my friend's Pomeranian. While she looked obviously adorable in the outfit, the sizing on the website is NOT the same as the sizing on the package and actual costume! This costume generally runs small, I recommend going up one size! Still and all, super cute and otherwise well made. Posted On 11/08/15 by Katherine E from , CA Yes, Katherine E recommends this product! We are making a calendar with pics of my Yorkies and this was perfect for November. Good quality, fits well. My boy Yorkie weighs about 7.5 lbs. and the size 3 fits great. Posted On 11/12/14 by MIRIAM M from Everywhere, Yes, MIRIAM M recommends this product! Fits perfectly, even the hat. Hats usually need to be altered for 4.2lb. Maltese. He will certainly impress the residents of the Assisted Living Facility where he will do Pet Therapy for Thanksgiving with my other Maltese dressed as an Indian Girl. Posted On 11/12/13 by Tiffani B from Commerce City, CO Yes, Tiffani B recommends this product! This costume is very cute.It is well made.I am very happy with this product. Posted On 11/08/13 by Peggi L from Carlsbad, CA Yes, Peggi L recommends this product! Zack looked like a million bucks in this and the picture with Zoey is one of the most popular I have taken. Well-made and fit perfectly. It's hard to fit him usually but this one was a great fit. I was both satisfied with the product and the customer service.